industry for their livelihood and quality of life. as these milestones are achieved. Lodge at Sonoma Renaissance Resort & Spa. person who has been in the Sonoma Valley tourism industry for more than 25 years. cultivated relationships throughout the valley to promote the destination. writers, publications and other interested parties. 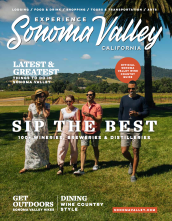 round, seven days a week to welcome visitors to Sonoma Valley. a at 453 First Street East). at 23570 Arnold Drive, Sonoma CA.